For all my love of Japanes sake, I’m not ready yeat to completely forget my roots. When there is good wine around, I see no reason to ignore it. 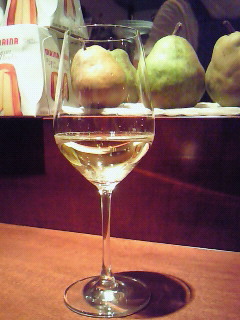 I thought it might be a good idea to taste the wines (within reasonability) available in this part of Japan! A great place to that is Lavigne in Shizuoka City, an off-the-track establishment which combines a shop and standing bar offerring exclusively French wines they have discovered and imported themselves. As I visit the place at least once a week for a quick glass, I fially took my pen and notes yesterday! Michel Dupont-Fahn is not an obscure wine maker in France and has incrasingly been praised for his somewhat extravagant single cepage Vins de Pays. Solid in spite of its youth. Surprisingly well-balanced. Soft on the palate with food. A wine for all seasons. As I mentioned in my previous tatsing I’m not ready yet to completely forget my roots. When there is good wine around, I see no reason to ignore it. This tasting also occurred at Lavigne in Shizuoka City! Saint-Veran is still a very new and still raltively unknown AOC from the very southern tip of the Maconnais area in Bougogne. Longer summers than in vaunted northern Bourgogne give it a different character. Colour: Beautiful, clear, limpid gold. Darker than usual Chardonnay. Aroma: Fruity, flowers. Pleasantly strong. Nutty, honey. Complex. Taste: dry attack. Longish but light tail. Nuts, macadamia, butter,memories of smoked cheese. Turns slightly sweeter with food. Pleasant finish expanding at the back of the mouth. Can be enjoyed on its own as well as with almost any food. Axel Prufer is a yaoung German vigneron who learned his trade before establihing himself in Languedoc, France in 2003. He is an active member of a new type of winegrower belonging to the “Natural Wine School”. This “Vin de Table/Table Wine” of his was conceived away from the higher appelations’ restrictions, but certainly has nothing to do with the legal Vin de Table! The alcohol content alone is a good enough indication. As for the price, although deserved, it would make vins de table inaccessible! Colour: Ruby red, very deep, clea. Taste: Soft attack backed by a little tannin. Strong red fruits: Strawberries, raspberries, cherries, blueberries. Taste lingering for quite long in the back of the mouth. Eminently drinkable. Goes well with meat and heavy sauces. 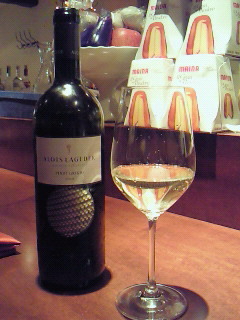 Last week i had the occasion to taste a somewhat unusual Italian wine at one of my favourite Italian restaurants in Shizuoka City, namely Trattoria Il Paladino. As for the great meal we had a report is coming soon! Don’t expect to find this wine on their “official” menu! You must ask for the owners of the place to look what they have stashed away/hidden in the cellar at the very back of the restaurant! Taste: Very light, almost feminine attack. Dry and fruity with muscat and green apples faithful to its aroma. Very pleasant and easy to drink, especially a little chilled. Very fine bubbles disappearing quickly. Holds its own well with food in spite of its light weight. 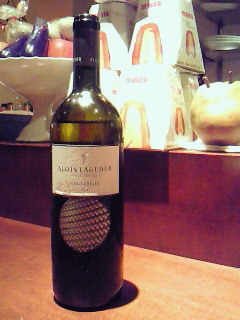 Overall: An unusual wine, very similar to an Alsace of the same grape. Very pleasant and light. Woth drinking with antipasti misto and fish. Will prove a great experience for young beginners!